STORE, owned and operated by Box Dock LLC, is Manhattan’s only self-storage company utilizing a retail storefront to deliver storage solutions to City residents. 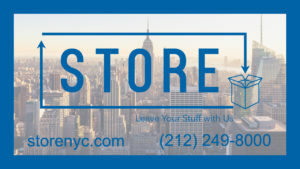 STORE provides affordable, safe and efficient storage solutions through their convenient location in the Upper East Side of Manhattan, New York City. STORE’s new local neighborhood storage solution gives clients a fast, efficient and affordable self-storage option which also includes pick-up and drop-off services. Located at 1290 3rd Avenue, STORE’s friendly staff is ready to help clients with all their storage needs. More information can be found at https://storenyc.com. STORE prides themselves on providing the most cost efficient storage in New York City, with plans starting as low as $8 per month. Their team of experts will find the perfect storage solution depending on the client’s individual needs, making storing your stuff as easy and stress free as possible. STORE offers fast and easy pick-up and drop-off service, as well as professional valet service. With valet storage service, clients save time, money and hassle as the company’s team of professionals manage the belongings and carefully moves them to the storage facility. In addition to high-level customer service and quality products, clients benefit from an easy to use software which ensures that the pickup and drop-off process runs smoothly and efficiently each and every time. At STORE, maintaining a secure facility is their main priority. The professional and friendly staff understand their customers’ unique needs in regard to storage and know the importance of delivering safe, clean and secure storage facilities. Interested parties can find more by visiting the STORE website at https://storenyc.com, or calling +1-212-249-8000. What are the odds? Colleges fear sports betting will lead to cheating.